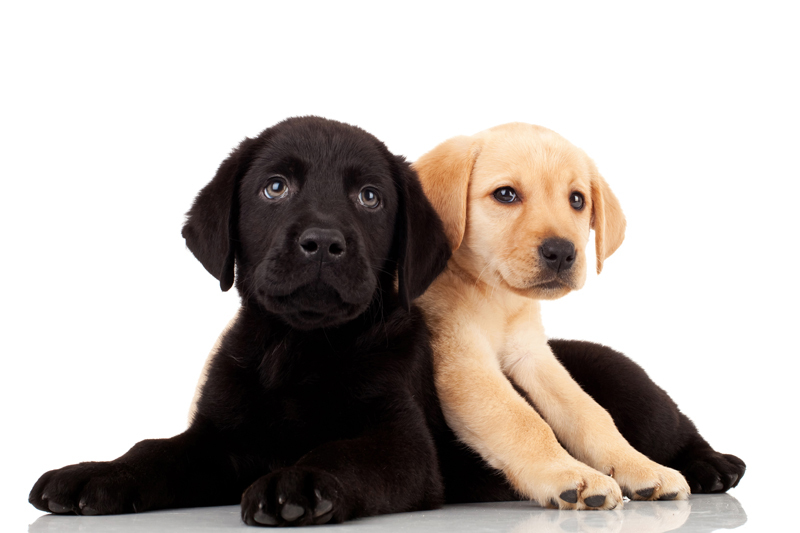 There are hundreds of different types of dogs and almost as many different coat types as there are colors. The type of fur your dog determines what kind of grooming is going to be best for him, and it's definitely something to consider when you're looking into what kind of dog you want to add to the family. First, the basics. Dogs have either a single or double coat. Single-coated dogs have one layer of fur, while double-coated dogs have a soft, downy undercoat designed to keep them warm, protected by a tougher, outer layer of fur that usually serves to keep the undercoat dry. These dogs typically shed - or blow - their undercoat once or twice a year. While shedding is limited during the other months of the year, be ready to brush and vacuum enough fur for a whole new puppy while they're going through their shedding phase. Smooth-coated dogs, such as the Dalmatian and the weimeraner, have hair that is extremely short and soft. Brushing is minimal, and they'll dry quickly after a bath. Some grooming is still required, though, as running a bristled brush over your dog will help remove dead hairs and keep his coat looking shiny. Medium-coated dogs, like many retrievers and shepherds, require a little more time and care. Bathing is required when he's dirty, as a simple brush won't remove mats or mud as from a smooth-coated dog. Some of the medium-coated dogs are also feathered, meaning they sport longer plumes of fur on their tails and legs; this can also add time and effort to grooming. Long-coated dogs can be the most difficult to keep clean. Mats and tangles can happen quickly in dogs like the bearded collie and the Shih Tzu, so regular brushing along with regular baths is a must. While these dogs should be soft and silky to the touch, some dogs sport a rough, bristly coat. These wire-haired dogs, including many terriers, don't shed. Instead, dead fur has to be removed by a process called stripping, and should be done on a regular basis to keep the dog's coat - and skin - healthy. Some dogs, like the Schnauzer and poodle, have what is considered hair instead of fur. Hair grows constantly, and dogs like this will require a trip to the groomer for a haircut in order to keep their coats under control. Dogs with fur have coats that will only reach a certain length, and as the fur is constantly replaced it always looks to be the same length and thickness. Some breeds have specifically different types of coats. Dogs like the Puli have corded coats, with fur that grows into long ropes that can be a challenge for even the most experienced owner. While typically mats are a problem, a corded coat will naturally mat in order to create a weatherproof barrier between the elements and the dog. And for something truly different? The Chinese Crested and the American Hairless are just that -- hairless dogs with delicate skin that requires conditioning and often lotions to keep the dog comfortable and healthy.